I am extremely fond of scary stories. Especially ones that were never solved and their memories now just exist in stories and leave us in mystery and bewilderment. One of my most favorite stories that always sent a chill up my spine. In 1584, Sir Walter Raleigh dispatched an expedition to the East Coast of North America as Queen Elizabeth I had given him permission to colonise Virginia. He returned from the trip with two American Indians and samples of animals and plants. Between 1585 and 1587, two groups of colonists were left on Roanoke Island (part of present day North Carolina) to establish their settlement. They were led by John White, an artist and friend of Raleigh who had accompanied the previous expeditions to Roanoke. White re-established relations with the neighboring Croatanstribes and tried to re-establish relations with the tribes that had attacked a year previously. The aggrieved tribes refused to meet the new colonists. Shortly thereafter, a colonist was killed by natives while searching for crabs alone. Fearing for their lives, the colonists persuaded Governor White to return to England to explain the colony’s situation and ask for help. There were approximately 115 colonists—the 114 remaining men and women who had made the trans-Atlantic passage and a newborn baby, who was the first to be born in the new country—when White returned to England. When White returned in August 1590, the settlement was deserted. There were no signs of a struggle and no remains were found at all. The only clue was the word “Croatoan” carved into a post of the fort and “Cro” carved into a nearby tree. The settlement became known as the Lost Colony and no members of it were ever seen again. All the houses and fortifications had been dismantled, which meant their departure had not been hurried. Before he had left the colony, White had instructed them that if anything happened to them, they should carve a Maltese cross on a tree nearby, indicating that their disappearance had been forced. As there was no cross, White took this to mean they had moved to Croatoan Island, but he was unable to conduct a search. A massive storm was brewing and his men refused to go any farther. The next day, they left. 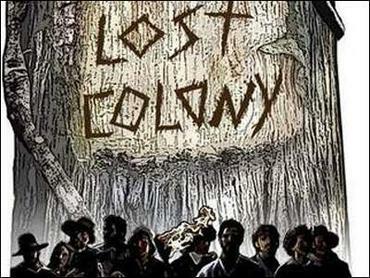 The end of the 1587 colony is unrecorded (leading to it being referred to as the “Lost Colony”), and there are multiple hypotheses as to the fate of the colonists. Some speculation exists today which suggests that the settlers left and merged with some of the nearby tribes. This is supported by the fact that many years later some of the tribes were practising Christianity and understood English. It has been hypothesized that the colony moved and was later destroyed. When Captain John Smith and the Jamestown colonists settled in Virginia in 1607, one of their assigned tasks was to locate the Roanoke colonists. Native Americans told Captain Smith of people within fifty miles of Jamestown who dressed and lived as the English. One possibility is that the colonists simply gave up waiting, tried to return to England on their own, and perished in the attempt. When Governor White left in 1587, he left the colonists with a pinnace and several small ships for exploration of the coast or removal of the colony to the mainland. In 1998, East Carolina University organized “The Croatoan Project”, an archaeological investigation into the events at Roanoke. The excavation team sent to the island uncovered a 10 carat gold 16th century English signet ring, gun flints, and two 16th century copper farthings at the site of the ancient Croatoan capital, 50 miles from the old Roanoke colony. Genealogists were able to trace the lion crest on the signet ring to the Kendall coat of arms, and concluded that the ring most likely belonged to one Master Kendall who is recorded as having lived in the Ralph Lane colony on Roanoke Island from 1585 to 1586. If this is the case, the ring represents the first material connection between the Roanoke colonists and the Native Americans on Hatteras Island. Another investion that is going on is the Lost Colony DNA Project. It is an ongoing effort underway by the Lost Colony of Roanoke DNA Project at FamilyTreeDNA of Houston, TX. The project will use DNA testing to prove or disprove that some Lost Colony survivors assimilated with the local Native American tribes either through adoption or enslavement. The project will attempt to locate and test as many potential descendants as possible. Testing is also planned for some of the recovered remains. What is so eerie is the very fact that they disappeared without a trace. No matter how hard scientists or historians try to solve this mystery, time seems to cover it up more. The only ones who have the answers are the trees, and perhaps the very earth that might carry the final remains of the settlers that were lost with out a trace. This entry was posted in Blogging, Conspiracy Theory, History, Opinion, Past, Unsolved Mysteries and tagged History, The Lost Colony, Unsolved Mysteries, What the .... Bookmark the permalink. I am actually quite familiar with this story and have been lost in the mystery of it all myself. There are so many possibilities as to the outcome of the settlers but the reality remains that each of these possibilities should have left some sort of remnants of them behind. Some of life’s mysteries will never be solved, but that bothers me. So I’ve set off on my own quest for answers and discovered that there must be an alternative explanation to this all. 2) Their colony was taken over by Edward’s family in an attempt to redirect attention away from them. The colonists are now all vampires who only come out at night because all of the sparkle in the sun would be a dead give-away. These colonists are the evil vampires out to kill Bella as revenge for making them disappear. U know after weighing your theories … I would have to say option 2 is the one I am going with. It just makes sense that it was vampires. Damn those vampires. Can I get a what what for the werewolves?!?! The Lost Colony is my passion also. Just wanted to point out that Raleigh never visited Roanoke as Queen Elizabeth would not let him. The 1584 exploratory party was led by Barlowe and Amadas. They didn’t stay long. The next year about 100 men came to stay indefinitely. Sir Richard Greenville was heavily invested in this colony. Ralph Lane was left in charge. After one year and running low on supplies and experiencing a terrible hurricane, they accepted Sir Frances Drake’s offer to return them to England. The following year in 1587 about 117 men women and children came to stay. Things went badly from the first. John White returned to England and when he was finally able to get back three years later, all the colonists had disappeared without a trace. I love that story too! Def weird.